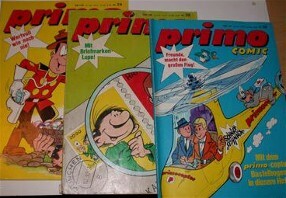 Primo magazine (Condor Verlag, see book chapter) did publish several issues with Prinz Eisenherz. 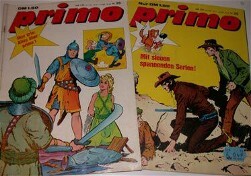 In their first year of publication, 1971, they did print our hero in at least volume 24,28 and 30. In 1972 they did publish Eisenherz in at least issue 25 and 26. Besides our hero Mischa, Der Sheriff, Marcus und Meister Müller, Wow Man, die Pichelsteiner and Jux von Jo-Jo (= Gaston) did appear in the same issues. Below are some examples ofto be seen, I 've got more in my archieve for real fans.